While federal immigration agencies have taken heat for selective “catch and release” protocols in the southern Texas border region as cost-cutting measures, California’s Trust Act is already evidencing significant drops in illegal immigrant deportations since the act’s initial enforcement in January 2014. According to data made available to the Associated Press from 15 California counties, local authorities have reported an estimated 44 percent drop in deportation cases. Though the AP notes that data reviewed is neither comprehensive nor available over an extensive period of time, some of the state’s largest counties offered glimpses into the law’s early effectiveness. Los Angeles, San Diego, Riverside and San Bernardino Counties helped demonstrate the total drop in cases from 2,984 down to 1,660. Prior to Governor Jerry Brown’s signing of the Trust Act, California county-level law enforcement would participate in Immigration and Customs Enforcement’s (ICE) Secure Communities program to screen arrested individuals for known illegal immigration matters through a variety of federal databases using fingerprint scans. Regardless of the nature of the alleged crime, “matching” illegal immigration records would typically trigger the federal deportation process. Thanks to Gov. Brown’s signing of the Trust Act, such processes have been blocked–with few exceptions. 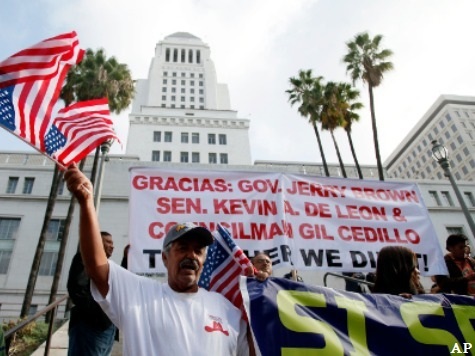 Shortly after the bill became law, a number of left-leaning illegal immigration nonprofits, including the American Civil Liberties Union, fired off letters to remind California law enforcement they would be keeping a close eye on cases of noncompliance with the Trust Act. Nonviolent criminal releases of illegal immigrants are nothing new, according to recent reporting at Breitbart Texas. As a matter of economizing enforcement resources, such as detention center space, ICE officials in south Texas recently announced a policy to release individuals with limited or non-serious criminal records, pending future immigration hearings. According to the AP, ICE has declined to comment on the impacts of the Trust Act at this time.